This unit considers ways in which artists can convey a sense of movement, action and narrative in paintings. Just as techniques of modelling and perspective defy the two-dimensional form of painting, to suggest three-dimensions; so too is it possible for artists to defy the static nature of a painting to suggest change and action. Look at Giotto's depiction of Judas's Kiss (c. 1304): click here (external link). The painting depicts the moment when Christ was betrayed by Judas, who kissed him to reveal his identity to the soldiers who are about to arrest him. Which precise moment is being depicted here? How does Giotto convey the chaos of the scene? Think about composition, the ways the figures are depicted, the colour, the use of light and dark, the postures. 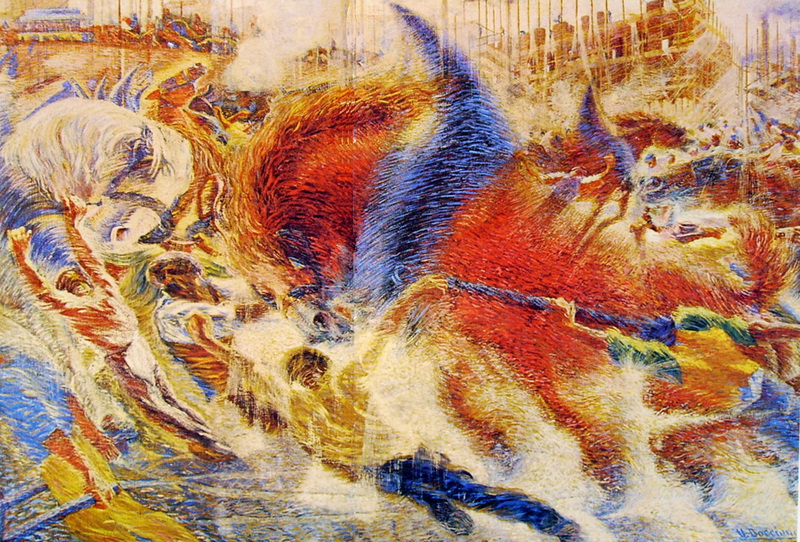 Look at Boccioni's painting, La città che sale [The City Rising] (1910): click here (external link). How does this painting create an impression of movement? Consider the composition, the force lines, the outlines of objects and figures, the colour, the brushwork.